Antiques series. Travelling through Norfolk, James Braxton tries his hand at bell ringing in Norwich and Anita Manning travels to Holt to visit a unique arts & crafts stately home. -It's a bit like fishing! The aim - to make the biggest profit at auction. But it's no mean feat. I had better look out! as two learned auctioneers battle for supremacy. -Well, they say all the nice girls like a sailor! I think I'm a mind-reader! Both our experts started this whole shebang with £200. and starts today with £197.50. growing his seed cash to a very healthy £297.10. Well done. That was a smashing result. the tres jolie 1986 Citroen 2CV6 Special. A lot going on in this car, isn't there? Actually, mirrors come as standard in motors, James! to the London Borough of Greenwich. On today's show, they're touring the noble county of Norfolk. Beginning in handsome Holt and heading for their auction in Diss. -I'll be hard, right. I'll be hard. -I got 5p off a packet of crisps the other day! No, it wasn't. It was first-hand! Jamesie, do you realise that you're giving me hints here? Well, that's part of the generous nature of the Southern gentleman! which is just inland from the coast. And it's very pretty, it's sort of 18th-century, Georgian market town. -But it's famous for its book shops and antique shops. So it should be right up our street. Most of medieval Holt was destroyed in a great fire in the 1700s. the Georgian streets we enjoy today. They're parking and splitting up to begin the day's shopping. -The winner so far. Give me some advice. -You need to buy well, buy cheap, and bye-bye! See ya! James is strolling off towards his first buy. -You never know what's around the corner. ..Where he's greeting the eponymous Richard. James has decided to mine Richard for some local knowledge. Richard, I'm off to Diss for the auction. What sort of thing would you suggest I took to auction? You could take them a rather large, tempting set of china. Sounds smashing! Lead on, Richard. -Who is it made by? Is it, what, a Staffordshire maker? founded in the late 1800s. worked for Wilkinson and eventually married its proprietor. it dates from the 1930s. So there are your main plates here. And these are your serving plates. So you've got little plates. Two, four, six. So you've got six in all that. Oh, we've got a vegetable tureen. Rather fun. Nice octagonal shape. There's the maker. Wilkinson. And then this is for your Sunday roast. Two, four, six. So we've had a couple of casualties there. But they all look in very bright order. -So there's about 34, 35 pieces in all. So, you know, these used to make £10 or £15. -Little ladles for gravy or onion sauce. -Hungry for a bargain, I'll bet. so James will have to make an offer. Stand by. What would I like to pay for it? Between 50 and 60. -so we could move down or up. -Down would be lovely for me. -Up would be lovely for you, Richard. How near £50 could I get it? -I think we could do £50. where she's greeted by owner Mandy. -Hi, lovely to meet you! and Anita's having a right good rummage through the ample stock. and before long a handy little thing of Celia's has caught Anita's eye. -This wee paperweight here - is this yours? -Could I see it out? and mounted on a small marble plinth. Handy! -Common motif in Victorian objects, this gloved hand. A bit sort of strange, a bit sort of scary. You have £10 on that. "Anita, you've got to be disciplined and you've got to bargain." Give it your best shot, Anita, go on. -Can I buy that for £5? -Could you come to six? -You're better at this than me. -You can buy it for eight. I think it's great, and I don't think it was dear in the first place. she still got a decent deal, and her first buy's, erm...in hand. Soon, she spied a gem of an item in one of the cabinets. What I've got here is a little nine-carat Edwardian brooch. but I'm not sure if they'll come down that far. -It all depends on the price. It's also insert with a ruby or a garnet. She's going to ask Mandy about it. Are you able to negotiate, or do we...? Shall we phone a dealer? -I can give him a ring. What's on the ticket? -It's 22 on the ticket. -Let's have a quick look. ..if he's only going to take a couple of quid off it. It's for Anita and she's being very sweet. And she said she'll talk to you if you don't give her a good price. 15, did you say? OK, 15 because it's you. Aw! Can I blow a kiss through the telephone? -She wants to talk to you for a minute. -Hang on. His name's Philip. You're a darling. Can I blow a kiss through the telephone to you? Look lively, Philip - Anita's going to turn on the charm. Could you go down to 12 on that? I know that you're already coming down substantially. I know you're already coming down substantially. And tell me to get lost if you feel like it. Aw, Philip, thank you so much. You're a darling. And that's such a good deal, it seems like Anita's quite smitten. That's enough of that, now, thank you. Mandy. That's good, that's two items and I've only spent £20. -Nice to do business with you. and he's gone barking mad for an unusual item. Here's a picture of the dog, so we've got a springer spaniel. dating from 1929, complete with a picture of the winning pooch. the way it's been framed is interesting. I haven't seen much to do with Cruft's, really. who's also a dealer with items in the shop. -Do you know how much he's got on that? -I'd have to give him a ring. -Do you want to speak to my son? Hello, I'm with your father, my name's James Braxton. And I'm just rather intrigued by your rather nice diamond-framed Cruft's first prize. What would be your price on that? 25 would be the best. OK, that's fair. Brilliant, OK, I'll pass you back to Father. Thanks a lot, bye. £25. It's a bit of a risk, that. It's very unusual. I haven't seen the like of it before. He's going to think on it. And shortly, his eye's caught by another item. This is a rather nice millefiori. named from the Italian meaning "thousands of flowers." This is a brooch with a silver-gilt mount. These are just canes of multicoloured glass that are then cut. and then it's mounted with silver-gilt. A pretty little item, isn't it? -Richard, could that be a better price? -It's got 20 on it, hasn't it? -Could I squeeze you a bit? -17 help a bit on that? I like that, I really like that. It's got colour, it got design, hasn't it? I think I'll definitely do 17 on that. but James's attention has strayed back to the Cruft's item. It's a bizarre thing, but it is fun. And we're going to quite a sort of doggy, farming part of the world. -I'll give Luke 25 for the Cruft's. Ah, James! You're "best in show," you know! This looks interesting, doesn't it? and meeting its hirsute, top-flight antiquarian book dealer, Simon Finch. -Come in! Very nice to meet you. -It's so nice to meet you. I have been so looking forward to seeing this house. the house is also one of the finest examples of the architecture in its style. which took place in the late 19th and early 20th centuries. which they felt the Victorian rise of mass production had diminished. which was finished in 1905. -Is this the main hall? I mean, this is by far the biggest space. so it actually is a very liveable house. It was built for the Reverend Percy Lloyd and his family. Their family made a big fortune out of publishing and so forth. But tell me about the architect - who was the architect? because the budget was meant to be 15, 20,000, and it cost 60.
and local materials be used to build it. using local craftsmen, gathering as much material from the actual site. But it's an immensely sophisticated and complex building, as well. was the wonderful quality of light that we have here. but there is a shape to the house. It's built on a butterfly principle, with the main body and two wings. This bit's directly south facing. And this allows the natural East Anglian light to flood the open spaces. but sadly, the wealthy clan who commissioned it never lived here. He never lived here, no. His wife is meant to have not liked it. Choosy, eh? Instead, the house passed to different tenants. and later became a sanatorium, and then a care home. that it was finally used as a domestic residence. So, Simon's taking Anita outside to get a view of the whole property. That's a very dapper outfit, Simon. Ah, isn't that absolutely wonderful? -Is this one of the architect's iconic buildings? It's unquestionably his domestic masterpiece. Unquestionably. But Anita needs to be on her way. She needs to get a bit Artsy and Craftsy herself. on to the town of Sheringham. The coastal town of Sheringham is known for inspiring great works. all lived in the town at one time or another. So, it's the perfect place for James to muse on his next buy. where he's making a new friend. James is keen to see if Christian might have any new stock he could strike a bargain on. I'll give you a fighting chance if I can. -Working man, and all that. I hardly call this tomfoolery work! Silverware's been going well at the moment. What have you got on the silver front? I put an absolutely gorgeous stamp box out this morning. -Have you? Let's have a look at that. -The shape of a knife box. -Oh, a sort of novelty thing. and modelled to resemble an 18th-century knife box. Its hallmarks date it to 1904 with a London manufacturer. Ticket price is £65 and it's gorgeous. It's got that sloping side so you can pick out those loose stamps. So, this was before stamps were... Oh, hello! -No, it's just the agility of an athlete like myself. and B - what could Christian do on the price of the stamp box? Give it a good licking? 40 would buy it today. And I'll buy it, Christian. That's really kind. Yeah, deal done with extreme haste. -Good. Thanks a lot, Christian. There we are. Hand over the stamp box and I'll be on my way. James, you do seem very keen to spirit that away. I wonder why? are reunited in the car at the end of a jam-packed day one. just revelling in the fine spring morn. -There's a wee nip in the air. The sunnnies are on, but the gloves are still there. Yeah - and the woolly whatsits. That's enough about your woolly whatsits, Anita. But it's quite snug in our little cabin, isn't it? -Aw, yeah, especially with you, James. the 1920s Cruft's prize and the little silver stamp box. He still has a generous £165.10 to play with. and the nine-carat gold brooch. She still has £177.50 in her sporran. And James is already crowing about his bumper day's buying yesterday. and I bought an item within three minutes. Really? Oh, James, you've got me worried. Or is this just a tactic? No, it isn't. I wouldn't toy with you. Spring is in the air, clearly. James is beginning the day in the town of North Walsham. The parish church of St Nicholas dates from the 1300s. rebels in the Peasants' Revolt to be slaughtered in the church. the day, Timeline Antiques Centre, where he's meeting dealer Michael. -Very nice to be here. -You are so affable, James. It's a delight. -Do you know, this is no time for a sit-down, James. Come on, boy, buck up. It looks as if he's found something, though. Interesting items. We've got a nice Doulton jug there. which was founded in 1815.
leather ale tankard, and bears an intriguing applied motto. I can't wait to read what the verse is. It'll be some improving verse. "He that buys flesh buys bones..."
"He that buys good ale buys nothing else." he has to ascertain which of the dealers in the centre owns it. Now, Michael, do you think somebody might accept £38 for that? Let's just have a look at the ticket. "MJ" - who's that? Michael...? I think I'm a mind-reader. -What's your best on that, Michael? I want you to be happy. -40, Michael - I'll give you 40. Another very decisive buy, and James is rolling onwards. Anita, meanwhile, has busked on to the city of Norwich. of its medieval charm, particularly on this historic street, Elm Hill. into Elm Hill Collectables, where dealer Paul will assist. -Hello, Anita. Pleased to meet you. to best James, and it looks like she might have spied a handsome one. -There's a lot of good-looking guys in Norwich - am I right? And I've seen one that I fancy. He's got a good body on him. It's this guy here. Oh, the one with all the pictures on him? Yeah, he's interesting, isn't he? I think it's quite good fun, and it's visually interesting. decorated with scraps in the technique known as decoupage. There's no ticket price on him, so Anita will have to enquire. Is he a terribly expensive guy? You can have him for £20. It's got to be £20, Anita. Deal? and she's spotted another couple of things just next to her new beau. The jacket and the hat, yes? and an Air Force blazer of more modern vintage. -You can have the jacket reasonable. -You're in the Navy, and I'm in the Air Force. -Goodness me, look at this! Well, they say all the nice girls like a sailor. -Yeah, but this is Air Force. -Ticket price on the hat is £30, but what can Paul do it for? -You know this stuff. What's the best buy? -Well, I said that for 15. You'll make money on that. James has also made his way onwards to Norwich. where he's meeting Simon Rudd - for a ruddy good time, we hope. -Simon Rudd. Pleased to meet you. I'm the master of the St Peter Mancroft Guild of Ringers. based at this magnificent 15th-century church. Is this merely a church, or is it a cathedral? It's one of the Greater Churches Group in the country. One of the glories of the city, indeed. One of the glories of East Anglia. -What are you going to show me today? and have a look in the treasury, if I may. -Oh, yes, please. Lead on. It's glorious, isn't it? history of bell-ringing at St Peter Mancroft. practised in English churches is known and change-ringing. Its history has strong ties to this area and to this very building. evidenced by the fine peal of 12 bells we have here already. a major place of bell-ringing history. and that was accomplished on the 2nd May in 1715.
that's it - it's gone. occasions - thankfully for James. I hope you're not going to make me ring a peal, are you? Well, we'll see how you get on. -I've only got two hours! -A couple of minutes, maybe. -OK, come up the tower and meet the band. -And they're heading up to the bell tower. -I've got to get through that...? -You might get in sideways. -Here's the jolly band of St Peter Mancroft Ringers. Hello. Good afternoon. Fabulous. They all look keen. and, as you can see, about half of them are here this afternoon to do some ringing. Will you ring the tenor, please? Neil, will you ring the 11th? Pete, will you ring the 10th, please? Mugs, will you ring the 9th? Yeah, stay out of the way, James - health and safety. We're just going to ring a few really nice rounds, on 12.
Who's your oldest serving member? -I think that would be David Cubitt. -This is David over here. -You look the youngest, sir. -How long have you been ringing for? -Oh, my goodness. Over 50 years. And does it get easier? Well, that bodes well, as virgin bell-ringer James gives it a pull. -So, you find me in the peak of physical fitness, Simon. because our bells are quite difficult to ring. to ring a bell, so if you'd just like to stand straight there. -This woolly part here is called the sally. -Sally belongs to me, so I'll look after that. -Here we go. Here we go. -And... Gently down, gently down. -That's it. And up again. I don't know if I could do three hours of this. -It's bit like fishing, really. -Well, if you say so, James. and I think it's a £50 membership fee, isn't it? Well, that's enough to ensure James thinks it's time to be ringing off. Thank you very much. It's been a real privilege. Goodbye. for her very last item. -Afternoon. Nice to meet you. This is really the weird and the wonderful. This shop is full of things that I don't know what they are. with some fearsome-looking iron manacles. I think, James, that maybe we'd a post there. -You know, like idea of stocks. ..buns or something at them! I very much doubt they would be pelting them with pastries, Anita! How old could this be? You know, I really couldn't say, it looks positively ancient. -Certainly a well seasoned beam. -We have the key for those. I suppose what we're seeing here is an old piece of mechanism. Absolutely, yes. And to have the key is certainly a nice touch. And it makes it quite practical as well. SHE LAUGHS Well, let's hope not! It is an interesting item and it's an odd item. -You can make me an offer. Can this be bought for in the region of £20? If we can do 25, yes. Right, James, 25, that's lovely, thank you very much. Anita has all her lots for auction. back in St Peter Mancroft Church and unveil their buys. -My word! What on earth is this? where they've stuck all these things on and varnished it over. -This man has a great body, but not much in the way of brains. -Now, what is this gruesome item? I think it's stocks, from ancient Norwich. And I thought, as well as wonderful, let's try weird. -And your lovely... What's this gauntlet? A paperweight? Victorian thing, not very dear, eight quid. -He seems impressed, but still unruffled. I have done the absolute converse of what you've done. So, I have spent some money here today. I went mad! -I bought a dinner service. -But this is a lovely dinner service. -And Art Deco, from the 1930s. How much? Tell me what this is, James. Just rather fun, it's first prizes of Cruft's. and it has a sort of decorative look to it. You don't seem to be sniffing around much on that, Anita. -But what about the ace up James's sleeve? -What is your little box? -This is my bargain, this is my winner. -Have a feel of it. -Oh, it's a stamp box. -How much would you value it at? -I would put that at 100 to 150. Touched hands with the man at £40. -I think we need one. a funny, quirky conversation piece, and at £25, it's not expensive. but as I know, the rug can quickly be pulled. James has spent an awful lot of money! He had a false sense of security and he has been a bit scatter-cash. Whereas I have been a wee bit careful. I think that means she doesn't like it. Lordy! from Holt, to find themselves nearly at their auction in Diss. a quintessentially English market town for more than 500 years. So, what better place for Anita and James to hawk their wares? James, it's just as well we've got the bunnets on today! I know, it's very, very rainy, isn't it? Come on. what does Elizabeth make of our happy pair's lots? I like James's Wilkinson pottery dinner service. Very jazzy, it's very Art Deco, and actually quite modern. is the Cruft's certificate with photograph. so I think, surprisingly, she is going to do quite well with that. So, I rate that highly for Anita. Anita started this leg with £197.50. She spent quite a parsimonious £80, but has five lots in the sale. and also has five lots to show for it. The sale's about to begin. -Here we go. Aah! I get quite excited. -I know you do, Anita. First up is James's massive Wilkinson dinner service. Will the crowd think it's worth a nibble? 40 bid, sir, thank you. 40, I have, the gallery's bid at 40, I'll take 42. 42 downstairs. 80, 85, £85, are you all done? -Well, that was a good start. First for Anita, her paperweight with modelled hand. Will it point to a profit? where's 42? At the £40, it will sell. It grabs a sizeable chunk of change. -It's a good start for Anita, isn't it? will the crowd fancy him as much as Anita does? I have bids on, I have to start at £30. -50, 55, 60, 65, 65 is bid, is there 70? We are selling at £65. Well, he's caught a few eyes, and the profit to prove it. -Well, he was a good-looking guy. -He was a good-looking guy. Now, it's James's Cruft's certificate. Anita is not keen on it, might he be barking up the wrong tree, then? 10 and bid, then, 10, I have, is there 12? For the £10, are we all done? Oh, dear. It was a dog, after all. -Don't worry, the big guns are yet to come. Ahoy, sailor! It's Anita's Merchant Navy cap next. Straight in at £30, 30 I have, who wants 32? And it snags a very nice price. A bit overboard, do you think, James? Hah! -Now, it's Anita's, um, interesting stocks. -We have to start at £60. 60 I have, where is 65? It's the stocks here, 65. 70, 75, 75 I have, is there 80? Selling at £75. Another lovely profit. James took a beating on that lot. Blimey, you are on a roll! I had better look out! So, can James gain some ground with his beer jug? I think they've got somebody on the phone. 60, is there a 65? Selling at £60. A delicious pint of profit to James. -Well done, darling, well done. You happy with that? Next, will Anita's little nine carat brooch strike gold? -Oh, look, Elizabeth's back. Coo-coo! -Pretty little brooch there for £20. Where are you? Come on. -Thank you, 22, the gallery. At £22, the gentleman has bid at £22, and selling. Another gold star for Anita. That's just about what it was worth. as James's millefiori brooch meets the crowd. 20 I have on commission, 20, I'll take 22. It's for nothing on 20, the little brooch, are you all done? Better than a poke in the eye, eh? Finally, it's the little silver stamp box for James. Is a profit in the post? First class! -Quite a lot of competition! -With me at 180 now. £200 profit? Cor, sterling work, eh? Oh, James! That was great! -Oh, that was so exciting, wasn't it? -240! That is indecent, almost. That was wonderful. Shall we go and have a cup of tea? You're buying! -I should jolly well think so, too! completely blew Anita out of the water. Anita started today with £197.50. After paying auction costs, she made a very tidy profit of £126.64. She has £324.14 to carry on to the next leg, which ain't half bad. of £168.30 and ends up with £465.40. -Well, James, that was absolutely wonderful. Yeah, we are both up there again. -But we mustn't be too smug or complacent. Off you pop, we'll see you on the next leg. On the next Antiques Road Trip, James is under fire. -And Anita is building her empire. -I'm awful tempted with Napoleon. SHE CHUCKLES I think a lot of women were! 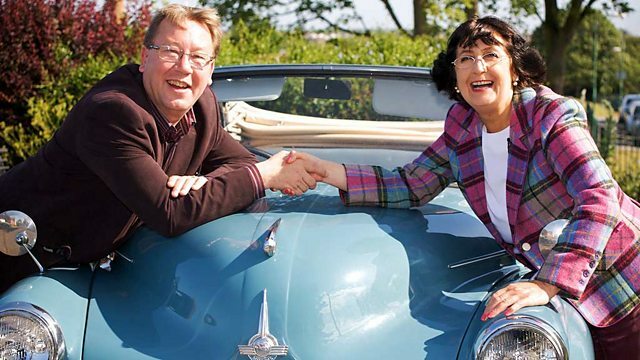 On the second leg of their road trip through Norfolk, James Braxton tries his hand at bell ringing in Norwich and Anita Manning travels to Holt to visit a unique arts & crafts stately home.